Nuclear receptor related 1 protein (or NURR1) is a protein that has been shown to have a powerful effect on the survival of dopamine neurons – a population of cells in the brain that is severely affected by Parkinson’s. For a long time researchers have been searching for compounds that would activate NURR1, but the vast majority of those efforts have been unsuccessful, leaving some scientists suggesting that NURR1 is “undruggable” (meaning there is no drug that can activate it). In today’s post, we will discuss what NURR1 is, what the new research suggests, and how this new research could be useful in the development of novel therapeutics for Parkinson’s. 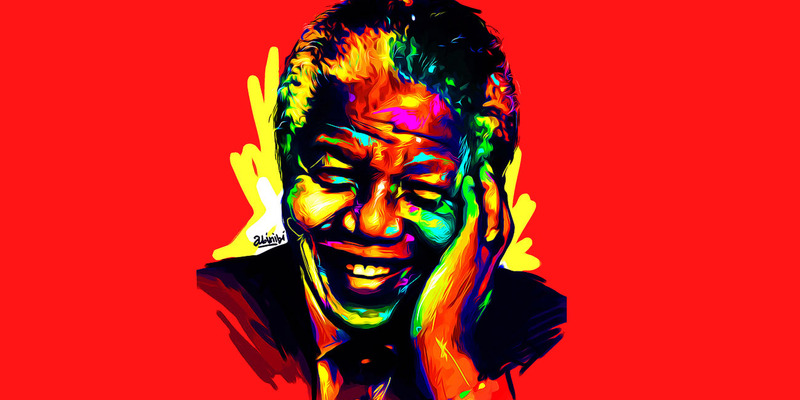 In 1997, when Nelson Mandela was stepping down as President of the African National Congress, some researchers in Stockholm (Sweden) published the results of a study that would have a major impact on our understanding of how to keep dopamine neurons alive. Dopamine neurons are of the one groups of cells in the brain that are severely affected by Parkinson’s. By the time a person begins to exhibit the movement symptoms of the condition, they will have lost 40-60% of the dopamine neurons in a region called the substantia nigra. 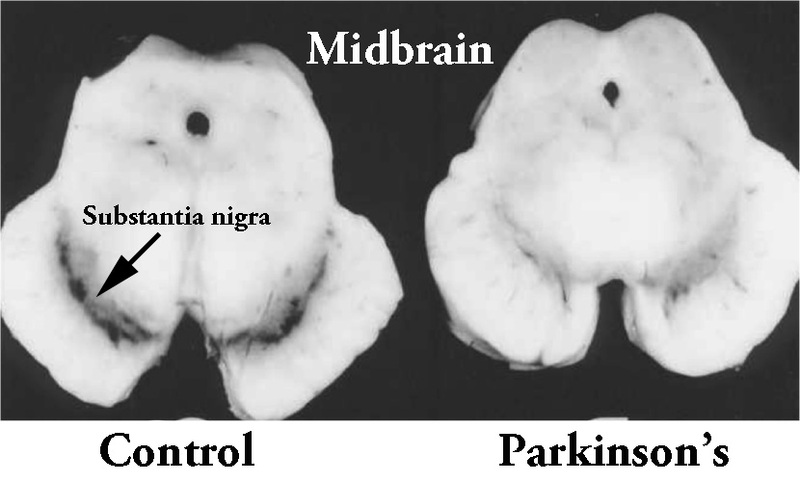 In the image below, there are two sections of brain – cut on a horizontal plane through the midbrain at the level of the substantia nigra – one displaying a normal compliment of dopamine neurons (on the left) and the other from a person who passed away with Parkinson’s demonstrating a reduction in this cell population (on the right). NURR1 is a transcription factor. Remind me again, what is a transcription factor? Remember those high school science class when you were half asleep and the adult at the front of the class was explaining biology 101? They were saying something about DNA giving rise to RNA, RNA giving rise to protein? The central dogma of biology? Does any of this sound familiar? Ultimately this DNA-RNA-Protein mechanism is a circular cycle, because the protein that is produced using RNA is required at all levels of this process. 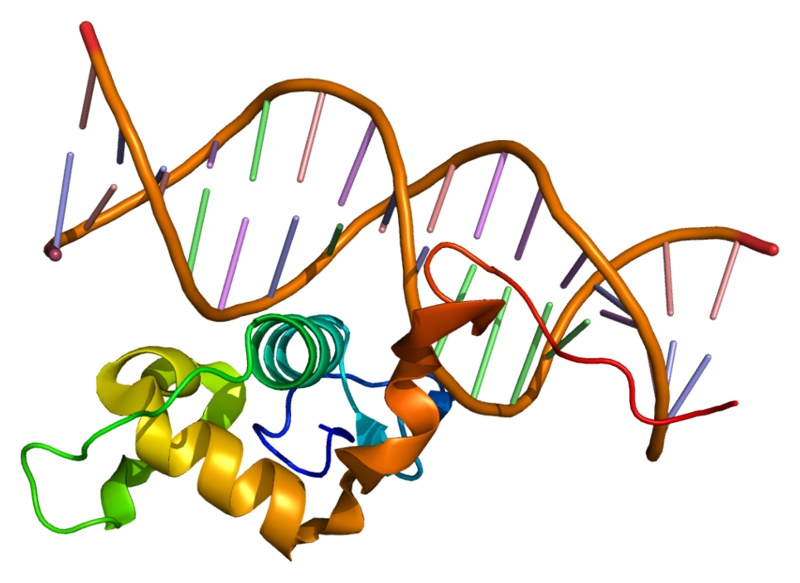 Some of the proteins are required keeping DNA healthy, some proteins are required for making RNA from DNA, while other proteins are required for making protein from the RNA instructions. A transcription factor is a protein that is involved in the process of converting (or transcribing) DNA into RNA. Importantly, a transcription factor can be an ‘activator’ of transcription – that is initiating or helping the process of generating RNA from DNA. Or it can be a repressor of transcription – blocking the machinery (required for generating RNA) from doing it’s work. NURR1 is a really interesting protein because it can function as either a transcriptional activator OR a transcriptional repressor, depending on the situation in the cell. In today’s post, we will look at NURR1 solely as a transcriptional activator. So what does NURR1 activate? NURR1 is very important for activating the transcription of a lot of genes that are required for making and maintaining a dopamine neuron. These NURR1-activated genes include many involved in the processing of dopamine, such as a gene called tyrosine hydroxylase (or TH) cause turns the chemical tyrosine into L-DOPA. 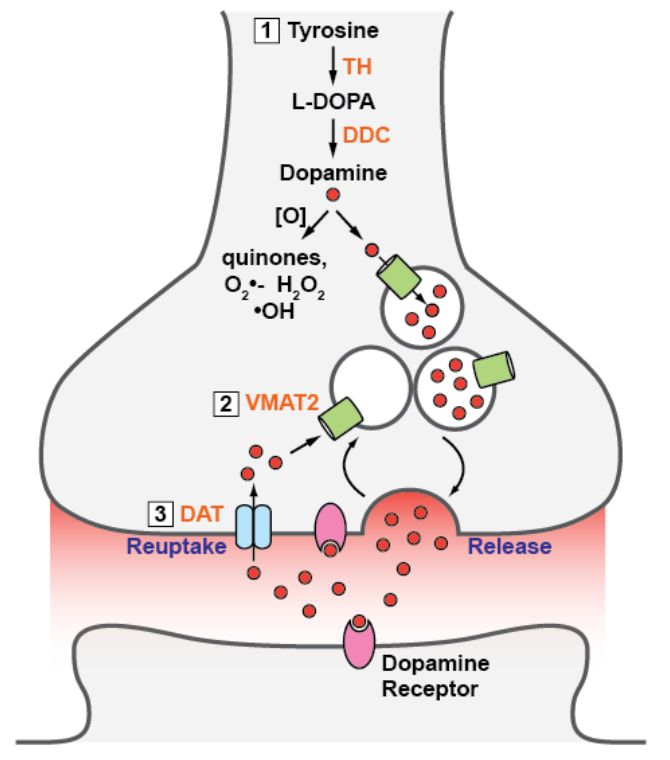 L-DOPA is then turned into dopamine by another NURR1 activated gene called DOPA decarboxylase (or DDC – see image below). Thus, if there is no NURR1, there is no dopamine. NURR1 also activates genes associated the packaging, releasing and recycling of dopamine (such as vesicular monoamine transporter (or VMAT) and dopamine transporter (or DAT). In addition, NURR1 is involved with the activation of genes required for the survival of the dopamine neurons, such as the receptor c-RET. cRET is the receptor for the neurotrophic factor GDNF (or Glial cell line-derived neurotrophic factor) which has had a long history associated with Parkinson’s (Click here to read a recent post on GDNF). And this close relationship between NURR1 and important survival factors is why when there is no NURR1, there is no dopamine neuron. How does NURR1 work then? With regards to the DNA binding domain, this is the part of the protein that actually makes contact with DNA. Nurr1 is known to activate transcription of certain genes by binding to a specific section of DNA called the NGFI-B response element (or NBRE). It does this by itself (or as a monomer). NURR1 can also bind to another section of DNA called the Nur response element (or NurRE). But it does this by pairing up with another NURR1 protein (two of them together is called a homodimer). And there is actually a third way NURR1 can activate transcription: it combines with a different protein called retinoid X receptor (or RXR). This pairing is called a heterodimer and this pair bind to a region of DNA called the DR5 site. How is NURR1 protein activated to do all of this? This is a really good question. Mostly because we have had such a hard time finding a natural ligand for NURR1. A ligand is a small molecule that binds to a protein and serves a biological purpose. Like a key that can activate the protein (in some cases). And yes, I know that I have just said that NURR1 has a ‘ligand binding domain’ – the region of the protein where ligands bind, but after two decades of looking, we have struggled to find any ligands. It was 15 years ago that the structure of the NURR1 receptor was first published, revealing the ligand binding ‘pocket’, but it was filled by “bulky amino acid side chains”, and to date the only compound that has been found to directly activate NURR1 is the antimalarial drug amodiaquine (Click here to read more about this). The lack of ‘natural’ ligands, however, has left the research field at a loss regarding how NURR1 is regulated. But more importantly, it has left the biomedical field without obvious potential drug candidates for initiating the activation of NURR1 in conditions like Parkinson’s – where it could have neuroprotective effects. So no ligand exists for NURR1? Authors: Bruning JM, Wang Y, Oltrabella F, Tian B, Kholodar SA, Liu H, Bhattacharya P, Guo S, Holton JM, Fletterick RJ, Jacobson MP, England PM. Given the pivotal role NURR1 plays in producing/handling dopamine, the researchers who conducted this study asked whether the receptor might be regulated by dopamine, L-DOPA, or one of the metabolites of these molecules. A metabolite is the by-product of a biological reactions; it is an intermediate or formed doing during metabolism. Dopamine is rather unstable when left doing nothing and it is broken down very quickly into metabolites if it is not used. These metabolites include a compound called 5,6-dihydroxyindole (or DHI). The researchers in this study found that DHI binds directly to the ligand binding domain of NURR1, and it also modulates the activity of NURR1. The investigators also found that in both cells grown in culture and small fish (zebrafish), DHI stimulated transcription of NURR1 targeted genes (such as TH and AADC). The researchers concluded that their data suggests that NURR1 is a ligand activated transcription factor. And given the nature of ‘the ligand’ – DHI – NURR1 may function “as a sensor for oxidative stress in dopaminergic neurons, responding directly to a specific oxidative metabolite of dopamine“. 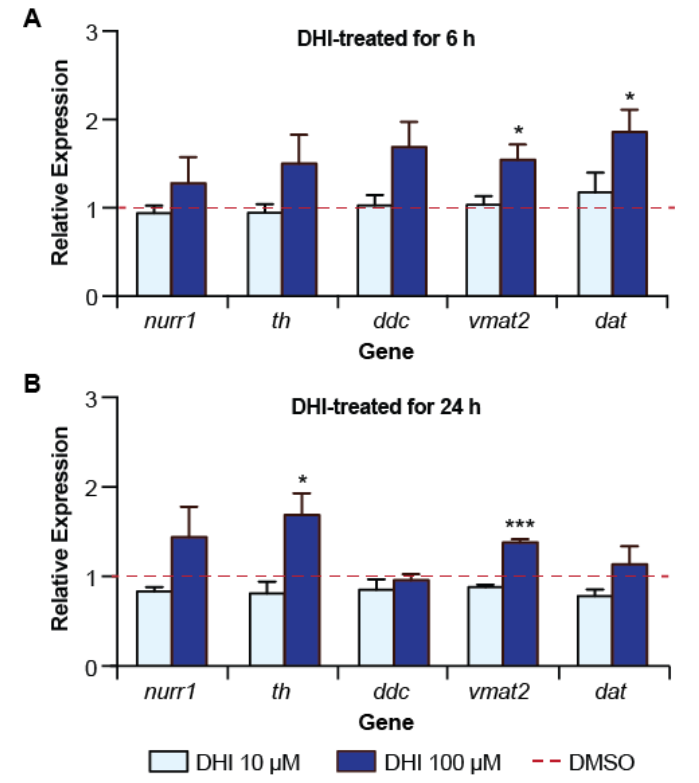 They speculated that DHI activating NURR1 may have a protective effect on cells by packaging and releasing dopamine and its oxidative metabolites. Wait. What? What does any of that last paragraph actually mean? What is oxidative stress? Oxidation is the loss of electrons from a molecule, which in turn destabilises that particular molecule. Think of iron rusting. Rust is the oxidation of iron – in the presence of oxygen and water, iron molecules will lose electrons over time. Given enough time, this results in the complete break down of objects made of iron. The exact same thing happens in biology. Molecules in your body are constantly going through a similar process of oxidation – losing electrons and becoming unstable. This chemical reaction leads to the production of what we call free radicals, which can then go on to damage cells by causing ‘oxidative’ stress. What is a free radical? A free radical (sometimes called a radical oxidative species) is an unstable molecule – unstable because they are missing electrons. They react quickly with other molecules, trying to capture the needed electron to re-gain their own stability. Free radicals will literally attack the nearest stable molecule, stealing an electron. This leads to the “attacked” molecule becoming a free radical itself, and thus a chain reaction is started. Inside a living cell, this situation can cause terrible damage, ultimately killing the cell itself. Antioxidants are the good guys in this situation. They are molecules that neutralise free radicals by donating one of their own electrons. The antioxidant don’t become free radicals by donating an electron because by their very nature they are stable with or without that extra electron. I see. So DHI is like a free radical? Yes, it is an oxidative metabolite of dopamine. And the researchers suggest that when levels of DHI get too high, DHI activates NURR1 which in turn activates biological pathways involved with packaging and releasing of dopamine and its metabolites (such as the protein VMAT). By isolating and removing these oxidative molecules, the activation of NURR1 by DHI could be considered a protective measure. Cool. Where can I get me some DHI treatment? This is a non-starter for several reasons. Firstly, the oxidative nature of DHI makes it an unattractive therapeutic option. And this is evident in the study, when the investigators used concentrations of DHI above 100μM, they found it was toxic for cells. Second, DHI also interacts with another protein we are very familiar with here at the SoPD website: Alpha synuclein. Remind me again, what is alpha synuclein? Alpha synuclein is a very common protein that is produced by cells in the brain. In this form, alpha synuclein is considered a monomer – which is a single molecule that can bind to other molecules. When it does bind to other alpha synuclein proteins, they form an oligomer (a collection of a certain number of monomers in a specific structure). In Parkinson’s, alpha synuclein also binds (or aggregates) to form what are called ‘fibrils’. And it is believed that the oligomer and fibril forms of alpha synuclein protein give rise to the aggregations of protein that go on to form the Lewy bodies, which are dense circular clusters of protein inside neurons. Lewy bodies are one of the characteristic features of the Parkinsonian brain. What happens when DHI interacts with alpha synuclein? You cna probably guess, but suffice to say: the outcome is less than ideal. 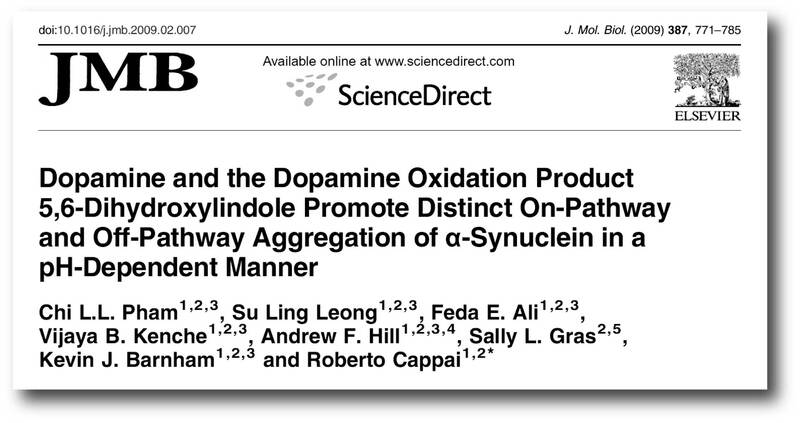 Title: Dopamine and the dopamine oxidation product 5,6-dihydroxylindole promote distinct on-pathway and off-pathway aggregation of alpha-synuclein in a pH-dependent manner. Authors: Pham CL, Leong SL, Ali FE, Kenche VB, Hill AF, Gras SL, Barnham KJ, Cappai R.
Journal: J Mol Biol. 2009 Apr 3;387(3):771-85. In this study, the researchers found that DHI (but not dopamine) interacts with alpha synuclein and mediates the formation of aggregates (under certain physiological conditions). This finding could support the idea that the activation of NURR1 by DHI could be considered a protective measure, as it activates genes that help to isolate dopamine and its metabolites. By isolating DHI from alpha synuclein, it limits the possibility of subsequent protein aggregation. Ok, so I won’t start taking DHI, but what will happen next? Well, we will need to see independent replication of the finding, which should not be too taxing for a lab with the right tools. And if the activation of NURR1 by DHI is found to be robust, researchers will probably start designing compounds that have the NURR1 binding properties of DHI, but do not have the oxidative side-effects. And such compounds would be of great interest for pharmaceutical companies as NURR1 is an interesting target for multiple neurological conditions, like Alzheimer’s, multiple sclerosis and stroke (Click here and here to read more about this). Given this last detail, I suspect there will be a lot of research following up this new finding. Summing up: NURR1 is a very interesting target for therapeutic intervention in Parkinson’s. It is a protein that activates a lot of important biological pathways involved in the development and maintanence of dopamine neurons – a population of cells that are badly affected by Parkinson’s. Researchers have been looking for activators of NURR1 for a very long time, and recently a group of researchers have reported the discovery of a potential modulator of the protein. Remarkably this new modulator is a bi-product of the metabolism of dopamine. This new discovery is great news not only from the view of better understanding the biology of NURR1, but also for advancing efforts to design therapies targeting this receptor. And this undruggable target now being druggable will hopefully have important implications for more neurological conditions than just Parkinson’s. It also goes it show (as Mandela said) that a thing is only impossible until it’s done. EDITOR’S NOTE: The information provided by the SoPD website is for information and educational purposes only. Under no circumstances should it ever be considered medical or actionable advice. It is provided by research scientists, not medical practitioners. Any actions taken – based on what has been read on the website – are the sole responsibility of the reader. Any actions being contemplated by readers should firstly be discussed with a qualified healthcare professional who is aware of your medical history. While some of the information discussed in this post may cause concern, please speak with your medical physician before attempting any change in an existing treatment regime. Could taking Levadopa/Carbidopa(Sinamet) also result in metabolizing into DHI? If so could it reach a toxic level?